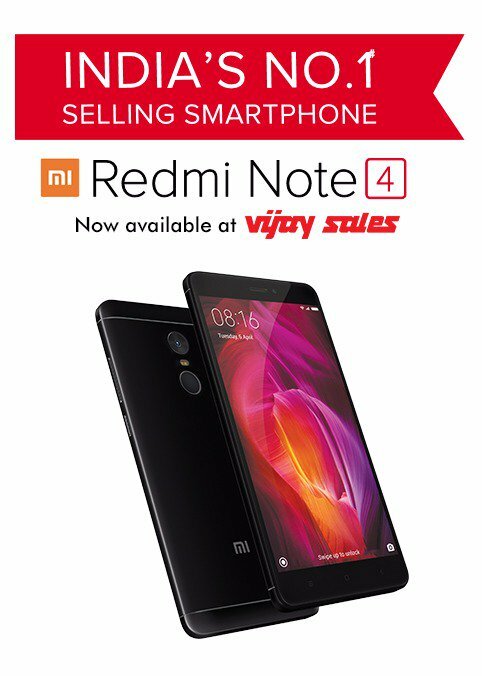 Xiaomi Redmi Note 4 is priced at Rs 11499 for 3GB RAM and Rs 13499 for 4GB RAM model.Redmi 4A is priced at Rs 6499. Xiaomi Redmi Note 4 has a Metal body It features a 5.5-inch (1920 x 1080 pixels) Full HD Display with 2.5D curved glass powered by a 2.0 GHz Qualcomm (MSM8953) Octa- Core processor.It has a 3GB/4GB RAM with 32GB/64GB of internal storage. Xiaomi Redmi Note 4 has a Fingerprint Scanner on Rear which also helps to capture Photos and IR Blaster on Top.On Camera, Redmi Note 4 has13-megapixel rear camera with f/2.0 aperture, LED flash and phase detection autofocus and 5 MP front facing camera. Connectivity options include 4G VoLTE, Wi-Fi 802.11 ac/b/g/n ( 2.4 / 5GHz), Bluetooth 4.0, GPS + GLONASS. packed with a 4100mAh Battery. Address: Infiniti Mall, 1st Floor, Lokhandwala, Andheri (West). Mumbai-400 053. Address: S.V Road, Opp. Filmistan Studio, Land Mark: Near Ratna Hotel. Goregaon (West). Mumbai-400 062. Address: 384, Veer Savarkar Marg, Opp. Sidhivinayak Temple Prabhadevi. Mumbai-400 025. Address: Prime Center, 18, S.V Road, Santacruz (West). Mumbai-400 054. Address: Indrapuri Society, Near Waman Hari Pethe Jwellars. Next to Cambridge Showroom. Opp. Sion Circle, Sion (West). Mumbai-400 022. Address: 68, Ground Floor, Dev Plaza, S. V. Road, Opposite Fire Brigade Station.Andheri (West), Mumbai-400 058. Address: Opp. Wonder Mall, Ghodbunder Road, Kapurbawadi. Thane-400 602. Address: Sant Sawatamali Vegetable Market, Opp. Bindu Towers, Santoshi Mata Mandir, Kalyan (West). Thane- 421 301. Address: Tania Shopping Mall, Next To D-Mart Mall, Babole Naka, Vasai (West). Thane-401 202. Address: Ground Floor, Mahipatrai Chamber, Opp. Axis Bank, Bhiwandi-Kalyan Road, Landmark: Opp. Reliance Fresh. Bhiwandi. Thane-421 302. Address: Samta Sadan, Near Veggies Restaurants. Landmark: Silver Park Bus Stop, Mira-Bhayander Road. Mira Road (East). Thane-401 107. Address: Konark Arcade Building No.-D, Ground Floor, Gharda Circle, Dombivili Sports Complex Ground. Landmark: Pendhekar College. Dombivli (East)-421 204. Address: Plot No.312, TPS No. 1, Leela Madhav Complex, Near Pune Highway, Village Panvel. Raigad. Navi Mumbai-410 206. Address: Survey No.5/6, Shop No - 16/17/18/19, Divya Heights, Aundh Annexe/Jagtap Dairy Rahatani, Pimple Saudagar. Pune-411 017. Address: Opp. Shantiniketan Apartment.Surat Dumas Road, Piplod. Land Mark: Near Kargil Chowk, Iscon Mall. Surat-395 007. Address: Raina Arcade. Next To Navyug College, Opp. Satyam Apartment.,Tadwadi Rander Road. Land Mark: Nr. Navyug College. Surat-395 009. Address: M-Cube, Jetalpur Road, Alkapuri, Chakali Circle, Vadodara-390 007. Address : Central Bazar, Opp. Varchha Police Station, Varchha Road.Surat-395 006. Address : Sigma Arcade, Near ONGC Complex. Near Visat Petrol Pump, Ahmedabad-Mahesana Road. Sabarmati. Ahmedabad-382 424. Address : Shop No.1,2,3. Maruti Plaza, Opp. Hindi Prakash High School. Near BRTS Bus Stop. Krishna Nagar. Ahmedabad-382 346. It is available online Vijaysales Website also. Xiaomi Redmi 4 is also available at other online stores for Rs 7499.